How are you fasting during Great Lent? This year, the Orthodox Church began its forty-day fasting period (more than 40 this year!) on Monday, March 14th, in preparation for Great and Holy Easter (Pascha) on May 1st. The date this year is especially far from Western Christian Easter, which will be celebrated soon on March 27th. Information on calculating the date of Easter can be found at the end of this article, along with other links for fasting. This short article will by no means capture the entirety of this beautiful tradition, but simply provide the basic introduction and direct you to additional content. Let us observe a fast acceptable and pleasing to the Lord. True fasting is to put away all evil, to control the tongue, to forbear from anger, to abstain from lust, slander, falsehood and perjury. If we remove these things, then is our fasting true and acceptable to God. This hymn is found in the Aposticha from the book of The Lenten Triodion. It was chanted during the Vespers service on Monday evening the 14th. Fasting is not just about food; it is also about practicing discipline and self-control. Essentially, this discipline of fasting, by simply controlling what goes into our mouth, provides us with the means to approach the ultimate goal and participate in the holiness of God. The tradition of the Orthodox Church shows us the whole person of body and soul is involved, in a spiritual and total commitment to God. The aspect of material fasting regarding dietary elements is temporary, while the spiritual component includes even greater challenges and expectations, and is sustained throughout our life. Two types of fasting, both of which are an integral part of a personal spiritual life. 1) The total fast, from all food and drink; by its very nature is short in duration. This is also known as the Eucharistic fast, and will normally be about twelve hours, or, from the evening meal (or midnight) to the time Holy Communion is received at the end of the Divine liturgy on the next day. In the case of the Liturgy of the Presanctified Gifts during Great Lent, usually celebrated in early evening, this fast may begin in the morning after a light Lenten meal or at least from noon. On a weekly basis, the faithful also practice Moderate fasting on Wednesdays and Fridays throughout the year in preparation for receiving the Eucharist. This type of fasting may include a meal of vegetables, pasta and shellfish (shrimp, squid, calamari) cooked with olive or vegetable oil. Nuts, beans and other protein sources are utilized when meat and dairy aren’t consumed during these days. 2) The ascetical fast, is extended over longer but specific periods of time throughout the liturgical year of the Church. During Great Lent, and 3 other Lenten seasons this year, the faithful participate in strict fasting. The regular, weekly Moderate fast, is now strict, which means that meats, poultry, fish, eggs, dairy products, olive oil and wine are usually excluded from the food partaken not just on Wednesdays and Fridays but the entire week. On Saturdays and Sundays, though, wine and oil are allowed with Lenten meals as something special, partially and temporarily suspending the strict fast. Sunday is the day of the Lord, reminding Christians of the Lord’s resurrection. Saturday is remembered as the Sabbath day, when God rested from his work of creation. Another small exception to the fast of Great Lent, is allowing fish to be eaten on the feastday of March 25th (Annunciation of the Theotokos) and on Palm Sunday. Once we arrive at Pascha, the entire week following (Bright Week), is designated by the Church as free of fasting altogether. This is one of 4 weeks total throughout the Church year where fasting is suspended altogether. Moderate fasting, is like a baseline, which is why it’s not numbered with the other two. It is practiced weekly on Wednesdays and Fridays throughout the year, unless these days are designated as fast-free or fall into one of the categories above. Roughly, over 200 days of the year are fasting days! So, why are the Orthodox Christians challenged to fast so much? This is answered with another question: How did we get here? The fasting period, before the observance of Pascha, gradually increased from several days of strict fasting to the entire Holy Week before Pascha, and then, to the forty-day fast we now have of Great Lent. The initial total fast of the only several days was naturally replaced by an ascetical fast that excluded certain foods, such as meat and fish, and animal products such as eggs and milk. Naturally, the Church allows for certain personal exceptions to be made for the very old, the very young, the sick, the nursing mothers and other people in extraordinary circumstances or with special needs. Fasting exceptions are to be made with discretion and appropriate guidance by your parish priest, in order to maintain the edifying nature of this discipline. The first examples of fasting after Jesus, are by the early Christians, who remembered Wednesday and Friday of each week because they are associated with the betrayal and passion of the Lord. They were designated to be days of prayer and fasting for Christians after the Church had separated from the synagogue. The 69th Apostolic Canon confirms this practice. By 325 AD, according to the 5th Canon of the First Ecumenical Council in Nicaea, the 40-day fasting period had become a well-established tradition. It is important to note that fasting is not a monastic innovation, as it already developed by this time in the Church, and was actually rooted in biblical tradition. This tradition was adopted and practiced by the early Church and continues to be practiced by the Orthodox Church to the present time. The first commandment of God at the beginning of human life was one of fasting. (Genesis 2:16-17); St. Basil the Great reminds us that Adam and Eve were given this stern rule to practice self-control and obedience to divine will. When Jesus began his public ministry, the Holy Spirit led Him into the desert and there he fasted for forty days and nights. 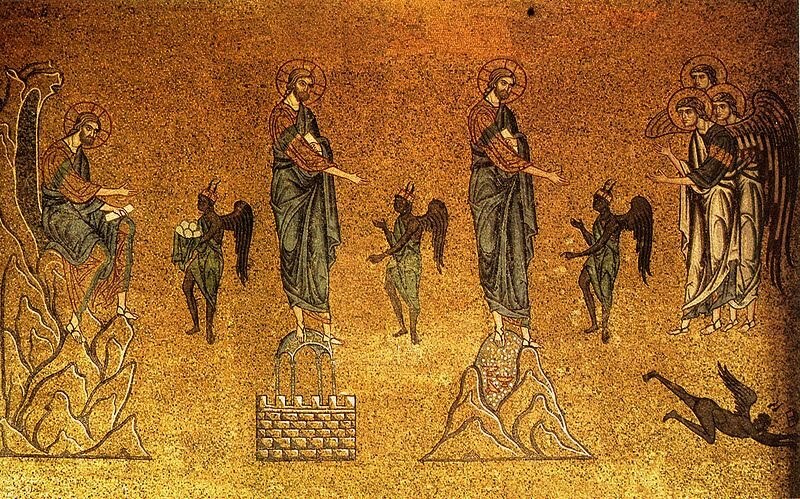 (Matthew 4:1-2, Luke 4:2); Jesus was tempted by Satan, as seen in the icon above, and in rejecting this temptation, he reversed not only the disobedience of Adam, but also that of the Israelites to the will of God. Jesus Christ confirmed the discipline of fasting by the Old Testament prophets, and gave His personal example for us to emulate. Jesus’ actions and teachings are clear, like the examples of the prophets of the Old Testament, fasting is a practice of religious piety and is meant to be an authentic expression of a person’s love for God and man. This is what motivates a person to do everything he does, which includes fasting! Like in the Praxis magazine article listed below, let’s end with a reminder from St. John Chrysostom taken from his Homilies on Fasting: that spiritual fasting is ongoing, even when this period of Great Lent is finished. For calculating the date of Pascha, see the article by Dr. Patsavos on Goarch.org. Much of the content for this article was sourced from the article found in Praxis Magazine, Spring 2015, by Rev. Fr. Peter Chamberas, titled: Not by Bread Alone, Fasting Today in The Orthodox Christian Way. It can be found at: Issuu.com/orthodoxmarketplace. Fr. Peter is also the author of a book dedicated to fasting, A Hunger for God: The Sacred Discipline of Fasting in the Orthodox Church, which can be ordered online via the Holy Cross bookstore.